On Monday evenings at the Cathedral, we house 24 homeless women for the evening. They find here a place of safety, peace, and welcome in the midst of lives of insecurity and fear. At 5:30 on Monday evening (and on each evening of the week) we offer our daily mass. Today, I was experiencing the full weight of jet lag after a mission trip to China. I was exhausted, cranky, and not feeling particularly holy or pious. I said the preparatory prayers by rote. I slipped on the chasuble as if it were rather heavier than its fabric would belie. I made my way out to the Altar as if I were about to undertake a long and arduous hike. Yet, after I entered the Chapel and kissed the Altar, I looked up and saw the smiling faces of eight women. Each of them is a volunteer in the women’s shelter. Their faces were literally alight with the joy of being together in service among those whom others try their hardest to ignore. I felt, in that moment, that Christ was making himself present. Before the manual acts. Before the Words of Institution. Before the Epiclesis. Before the Fraction. Before Receiving, Blessing, and Dismissal. Before all of this, Christ was coming among us. These faithful women reminded me of the women of the Gospels. The women who anoint, the women who truly see Jesus, the women who dare to proclaim Resurrection, the women who dare to ask questions, the women who serve with joy, the women who hold Jesus at the Creche and at the Cross. These women who come to mass and serve our un-housed sisters are God-Bearers. 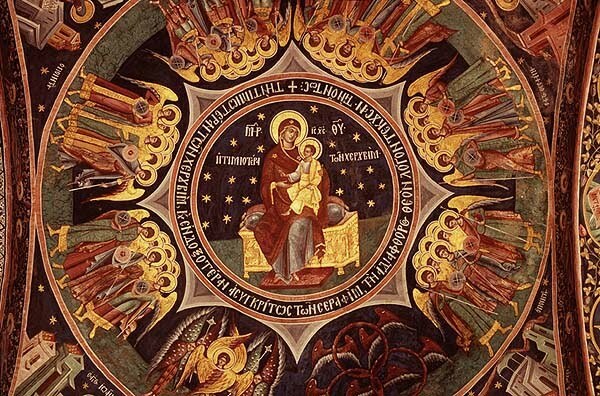 Each is Theotokos, carrying Christ to those who most need to know him. Today, it was not only the women who take shelter in our parish hall to whom they brought Christ’s Presence – it was to me they brought him as well. I needed them to lend me their joy, their hope, and their faithfulness. We were welcomed to a holy, divine exchange in that mass. Their service, witness, and joy was an offering and sacrifice that commingled with the Sacrifice offered in my hands as Christ gave us his own Self – his True Self – for us to know in that precious time together. I could feel the shadow of the Altar extend from the chapel to the nearby parish hall. I could feel its calming shade defying the heat and hurry of the world. As mass ended and I told them to “Go in Peace, to love and serve the Lord,” I said it with a bit of a grin because these women were literally about to go out of the Chapel doors and do precisely that – and you could see it in their smiles. You could see it in their gentle firmness. You could see it in their warm companionship. You could see it, know it, and feel it in the way Christ looked back from each of their eyes. Well said my brother in the Lord! And I thank you.